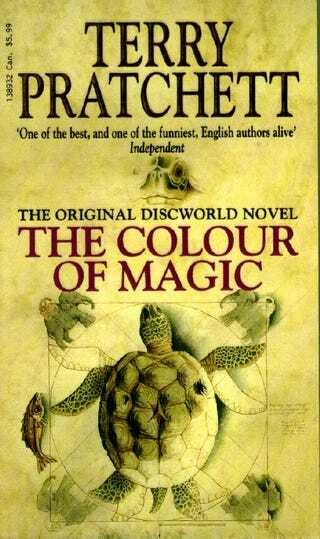 Beginning March 12th, Mark Oshiro (of Mark Reads, Mark Watches and Mark Plays) will be reading Terry Pratchett's Discworld novels in chronological order, beginning with The Colour of Magic. With the sheer number of Discworld books, this means that he's going to be doing this for a really long time - you can check his master schedule at each of the sites linked above for information about which book will be read when. Mark didn't read a lot of SF/F while he was growing up, so he is completely unspoiled for everything on his schedule. His past book reviews include the Harry Potter and Twilight series (he didn't like Twilight so much), as well as many others. I've been reading Tamora Pierce's Tortall books along with Mark for the past six months or so - even though I've already read the books before, I've found it to be a really enjoyable experience to see someone reading them for the first time without knowing anything about them. It makes me feel like I'm reading them for the first time, too. Mark has a strict policy regarding spoilers, and the mods there do their best to stay on top of those. If you want to discuss spoilery things in the comments before Mark (or other first-time readers) gets there, use rot13 to hide them. Mark reads/watches/plays very much from a social justice perspective. If you don't care for that kind of discussion, or are bothered by people pointing out problematic things in books/TV shows/games that you love, this might not be for you. The site rules and spoiler policy are here. When Mark reviews books, he'll write a post about each chapter/section as he reads it. When readers commission videos, he will post those videos of himself reading as well. Once the Discworld books have been divided into manageable sections, they will be available to commission at this link here. It's totally worth it to see his reactions to big plot twists. As Mark says, he is perpetually unprepared.